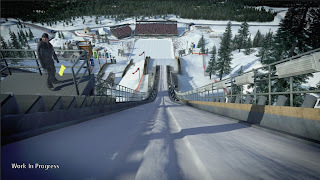 Ah, the Winter Olympics. You come around every 4 years or so, and you take over my prime time programming for two weeks. This year, you're coming hot-off-the-heels of the NBC Late-Night drama with Conan vs Leno vs NBC (hint: Conan lost). In fact, what better way to get viewers to tune in to the drowning network. Conspiracy? That's for another blog. 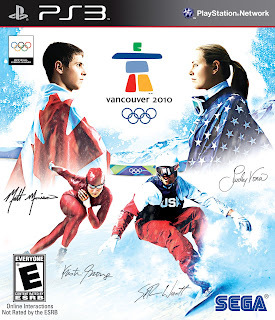 Today I opened up my package from Sega; my quest for the Gold awaits me in Vancouver 2010 on PS3. Unfortunately, my first play-through of all the available events, I managed to only win one meager Bronze medal. My second play-through I had 4 Bronze, 4 Silver and 1 Gold Medal for the US. 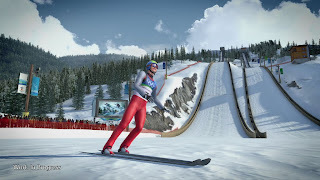 The game pits you as a fairly anonymous Olympian, (male and/or female) competing in 14 events, each with it's own rules, and controls. I highly recommend the training mode before each and every event. Some events are rhythm based (Short Track Speed Skating: Ladies' 1,500 m), some are straight-forward down-hill racing. 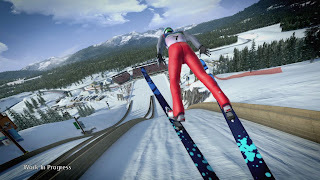 Others have you timing a series of button presses as you attempt a big ski jump, or aerial freestyle. You can take on a single event, stack a few, or even stack them all to compete in all. As far as any semblance of a career mode, or progression-mode, you won't find one here. The game lacks in this department, leaving alot to be desired by those of us who enjoy picking a character, and growing your skill-base while working your way up the skill ladder. I'm not even sure if picking a different country gives you any competitive advantage over another, as there's no ratings system at play here (at least not one that's transparent). There is a Challenge Mode that sets you up with specific tasks that will in time refine your skills, but other than actually getting better at the event, your character is not enhanced in any way. The game offers up all of it's events in multiplayer as well. You can go at it split-screen style, or head over to the PSN (or Xbox Live) to compete against friends and strangers. That fun only lasts so long though. Overall, Mashbuttons gives Vancouver 2010 a 6 out of 10. The graphics, sound and control are all spot on - unfortunately, it lacks the depth to make this a truly remarkable sports title. You are so hot Joey! All the girls at our sorority house love you! Joey is hot but Dominic is super YUMMY! !